This recipe is dairy-free and, unlike making caramel dip, you won’ t even have to cook (i.e., risk burning) anything! You can eat it right away, but we prefer to let it chill completely in the fridge first. Store extra (if there is any) in the fridge, as well. This tastes great eaten straight out of a bowl with a spoon, too!!! Who needs the apples?! LOL! BLENDER NOTE: While the gooey texture of this dip is best achieved using a high-powered blending machine, it is possible to make this recipe in a food processor. Just substitute three-fourths of a cup of cashew butter for the cashews, and reduce the amount of grapeseed oil from a half of a cup to a fourth of a cup. The dip will taste great, but it won’t be as smooth and gooey as it is when using a high-powered blender. However, because a food processor won’t heat up the dip as much as a high-powered blender, the dip is generally cool enough to enjoy immediately when made in this fashion. 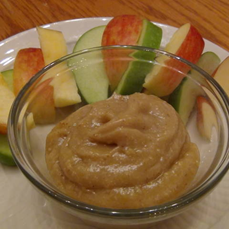 This entry was posted in Recipes and tagged apple, candy, caramel, cashew, dates, dessert, dip, honey, snack, sweet. Bookmark the permalink. ← My first article on NaturalNews.com – MSG is HIDDEN in food!